"It was very quick. 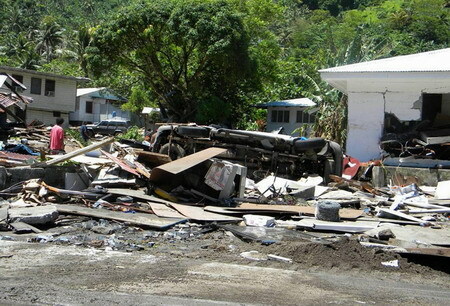 The whole village has been wiped out," Ansell told New Zealand's National Radio from a hill near Samoa's capital, Apia. "There's not a building standing. We've all clambered up hills, and one of our party has a broken leg. There will be people in a great lot of need 'round here." 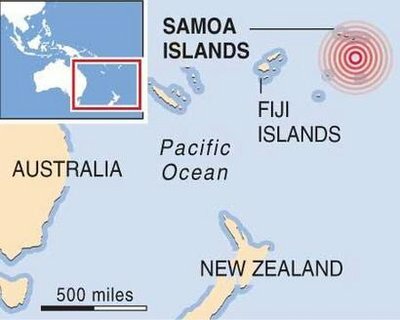 Local media said they had reports of landslides in the Solosolo region of the main Samoan island of Upolu and damage to plantations in the countryside outside Apia. Chicken of the Sea's tuna packing plant in American Samoa was closed after the tsumani hit, although the facility wasn't damaged, the San Diego-based company said in a statement. Tuna canneries are American Samoa's dominant industry, accounting for nearly 60 percent of all economic activity. Prior to tsunami, Chicken of the Sea had announced plans to close the plant on Wednesday, laying off more than 2,100 workers. Rear Adm. Manson Brown, Coast Guard commander for the Pacific region, said the Coast Guard is in the early stages of assessing what resources to send to American Samoa. Coast Guard spokesman Lt. John Titchen said a C-130 was being dispatched Wednesday to deliver aid, asssess damage and take the governor back home. A New Zealand air force P3 Orion maritime search airplane also was being sent. One of the runways at Pago Pago (Pan-go, pan-go) International Airport was being cleared of widespread debris for emergency use, Federal Aviation Administration spokesman Ian Gregor said in Los Angeles. The Federal Emergency Management Agency said it was deploying teams to American Samoa to provide support and assess damage. "Our thoughts and prayers go out to the people of American Samoa and all those in the region who have been affected by these natural disasters," Interior Secretary Ken Salazar said. 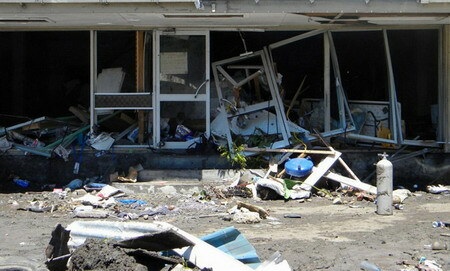 The earthquake and tsunami were big, but not on the same scale of the 2004 Indonesian tsunami that killed more than 150,000 across Asia the day after Christmas in 2004, said tsunami expert Brian Atwater of the US Geological Survey in Seattle. The 2004 earthquake was at least 10 times stronger than the 8.0 to 8.3 measurements being reported for Tuesday's quake, Atwater said. It's also a different style of earthquake than the one that hit in 2004.